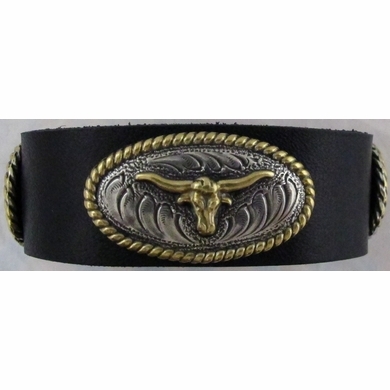 Full grain genuine Italian saddle leather wristband, featuring one central oval shaped concho with engraved detail, a raised gold finish longhorns motif, and gold finish braid border. On either side is a silver finish round concho with detailed engraving and gold braid border. The wristband is 1" wide with two snap closures to accommodate various wrist sizes.